Step 1 Heat the oven to 350 degrees F. Line an 8-inch square pan with 2 pieces of foil (crossed, and with excess hanging over on all sides of the pan). Lightly brush the foil with butter. Step 2 Melt the butter in a medium saucepan over medium heat. Remove from heat and immediately add the chocolate chips and cocoa. Whisk until smooth. Step 3 In a large mixing bowl, whisk the eggs, sugar, vanilla and salt to form a slightly thick mixture. Add the tahini and whisk to combine. Now fold in the flour, stir until just incorporated (do not over-stir). Reserve half of the tahini mixture in a separate bowl for later. Add the melted chocolate mixture to the remaining tahini mixture, stir until batter is well combined. Step 4 Pour the batter into the pan you prepared. Spread evenly. Step 5 With a spoon, dollop the reserved tahini mixture over the top (imagine a grid, and add one dollop of tahini mixture to each square on that grid). With the tip of a butter or pairing knife, swril the tahini dollops into the brownie batter. Step 6 Place the pan on the middle rack of the 350 degrees F heated-oven. Bake for 28-30 minutes, until the edges are set but the center remain moist. Remove from the oven. Cool in the pan for 30 minutes. Lift the foil edges up carefully to transfer the brownies from the pan. Cool for another 30 minutes (do not remove from the foil yet). Cut into 2-inch squares. Enjoy! 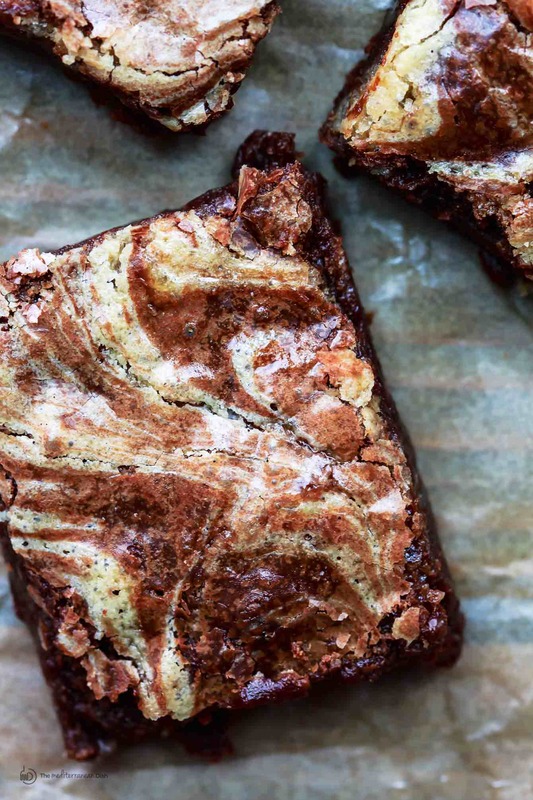 These tahini brownies are anything but your average, one-note brownies. Moist chocolate brownies with a generous swirl of tahini, a paste made from sesame seeds which takes the brownies to a whole new level of flavor bliss!